Surrounded by a rainbow of green and the scent of fresh spring forest, I hung out with my feet dangling and wide grin on my face. Nothing could ruin my spirits – especially at 100 feet off the ground! Gazing over the tree tops in the HA Andrews’ Experimental Forest while attached to an old growth, I breathed in the light and clean McKenzie River Valley air and took in the moment of my first successful tree climb. I had the joy this past week of taking a tree top adventure with Pacific Tree Climbing Institute. 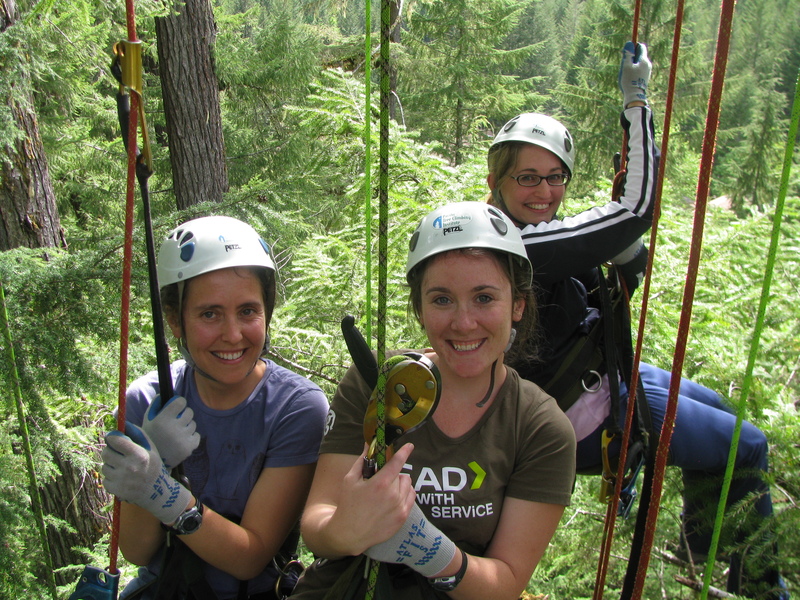 Based out of Blue River, Pacific Tree Climbing Institute is a registered Oregon outfitter that takes visitors on an amazing experience to explore the lush and alive forests of the Pacific Northwest. Using ropes and harnesses, the duo who owns the company, assist, train and teach guests of all ages and abilities how to climb into the forest canopy. Using my legs to boosted myself upward and then gliding my hands up the rope, I slowly but surely moved my way up the tree. The further up in the tree we progressed, the more the beautiful little details of nature popped out: the bark with its rough surface and color like rich, dark chocolate and sweet smell, the hanging gray-green beard-like moss, and the rush of the nearby the river. In the tree top, the forest fully came alive in an animated orchestra of textures, smells and sights. Only for a brief moment at the beginning was I afraid – where the heart quickly skipped a beat – but amazingly the higher I went the more confident and exciting the trek became. The first one to the top and the last down, I was a kid again as I hung about the limbs in that evergreen park. Beyond just leading quick day climbs, Pacific Tree Climbing Institute also offers overnight trips in the tree canopy and educational programs. 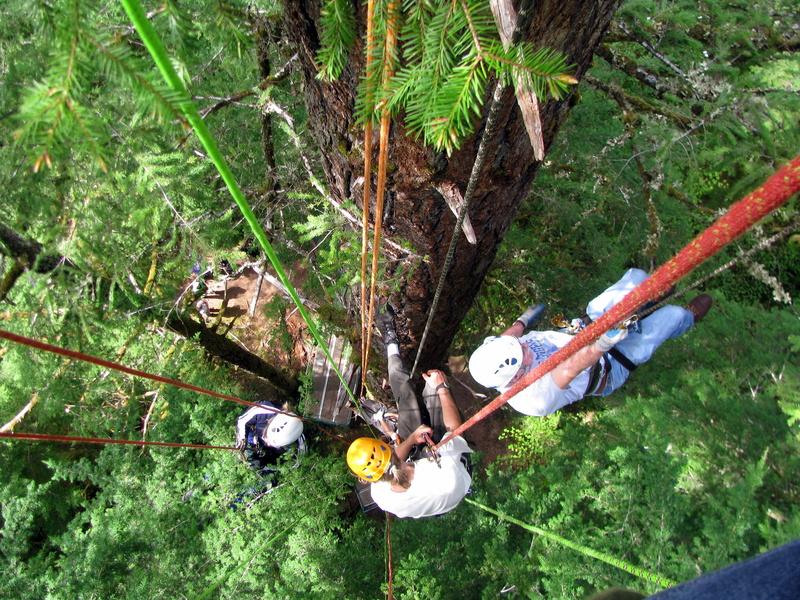 Find out more about Pacific Tree Climbing Institute and book an adventure that you won’t ever, ever forget! Better you than me up there, Kelsey!